It was the day our lives that we would never forget; call it "Destiny" if you will. 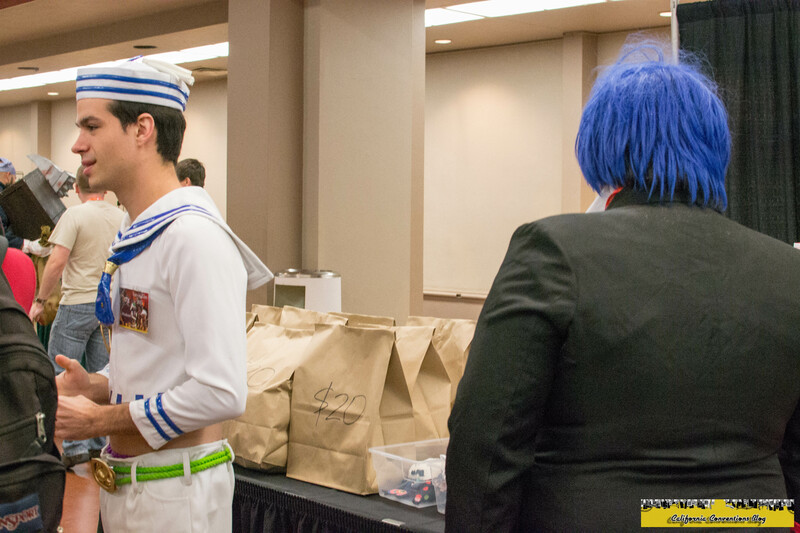 It was the morning of Day 2 at Taiyou Con. I had finally awoken from what I thought was a coma from the lack of sleep given that we had been traveling two for two days. After getting some well-needed breakfast, my body was ready for anything it could hurl at me. I got into my cosplay as Minato Arisato from Persona 3 and head down with the room crew to run the SMT/Persona gathering. Matthew taking a photo of my back at the Dealer's Hall. We ran into some hiccups with some Persona-themed panels overlapped the gathering but as time would pass it would grow over time. As we called the gathering over we went up back to the room to eat some minor lunch and again with the crew discuss and predict the set list. we made a small wager for later in the night for things we got wrong which turned out Matthew lost miserably. People waiting in line for the concert. We would finally line up an hour early for the concert. One of roommates had a minor error that was fixed by staff and then the concert itself would be delayed getting in due to some technical errors with sound. After some time passed, the VIP holders would get into the concert first meaning Matt, Danny and I would be front up of the hall. I would set up for some filming while Matthew readied his camera in the best possible spot up front. I couldn't believe we were minutes away from going to musical nirvana, but first up was the opener Mega Ran. I've had some mismatches in the past about openers and people I hadn't known about prior to conventions such as Yuya Matsushita back at Fanime 2011 but again I was blown away by him as he straight up killed it out there. 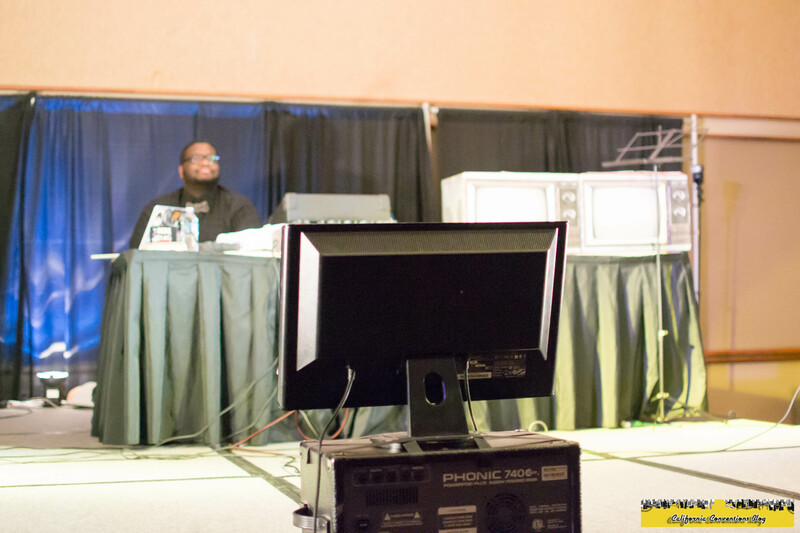 His music was something that was fresh and sounded like something you'd hear at VGML (Video Game Music Live). To think this man was a teacher from Philly now blowing our lids with mad rhymes about objects he found in the room would hype us for the main event. Matthew and I have been known to be a rowdy bunch at conventions either starting the concert/convention hype by chanting encore at the end of concerts or starting general chants in front of guests like Attack on Titan Director George Wada at Anime Expo or soon to be brought up on stage Kawamura-san, Hirata-san and Lotus Juice. 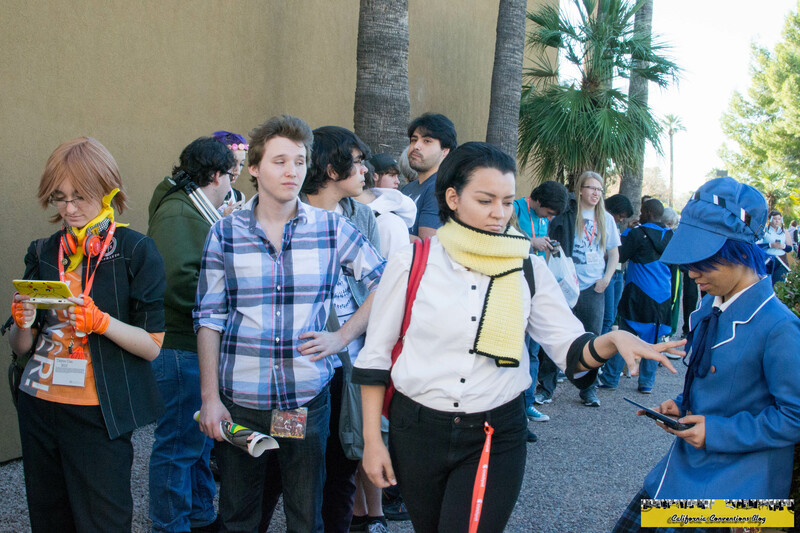 The dream was dead as it became reality and the "Persona Concert" was finally under way at Taiyou Con. I would hope to hear Hirata-san sing "Heaven" from P4 throughout the night but would not happen, although the minute I heard the rhythm for "Never More" I got excited because of the thing I was hoping more than anything would transpire. Like the Music Live crowd back in Japan, I too wished to serenade our guests toward the end by singing along to the lyrics of the song and everyone attended sang their hearts out, so much Hirata-san was on the verge of tears as seen by her expression. As the concert was winding down, Matt and I wouldn't have it and began our usual encore shenanigans. Sure enough the trio would return to the stage and give it their all with "Reach Out To The Truth". As announced prior to the start of the concert, there would be a signing for the musical guests. I also bought both of Lotus' CDs before the concert and I would have him sign Carpe Diem while all three guests sign the Persona Q Sounds of the Labyrinth CD I had brought with me. 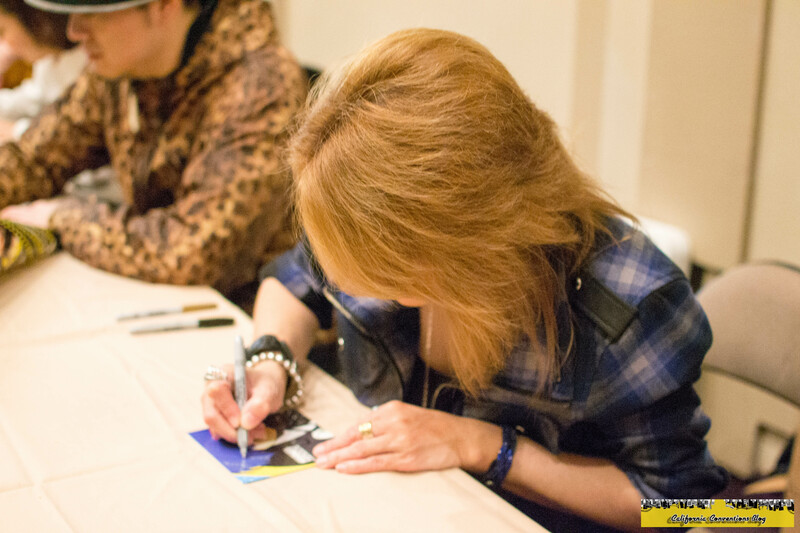 Kawamura-san signing the front cover. After all that had transpired, I thought I had died right then and there on the spot. I was so speechless that not even at In-N-Out I could run the usual "hype after concert" video. The night would end with some well deserved food that I haven't had in a few years and to see some Double-Double virgins from Portland eat their first bite. The room would have a celebratory drink and call it a night for the anticipation of the final day of con.